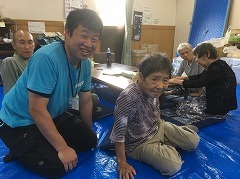 AMDA began its relief activities on 7 July in Soja City, and on 11 July in Mabicho (Kurashiki City) in response to the West Japan Torrential Rain disaster. AMDA carried out a wide variety of support activities, from medical relief, health consultation and acupuncture for evacuees, to heatstroke-prevention for the local people and volunteers who were working hard to clean up the area and the people’s houses. Although AMDA’s emergency relief period ended on 15 August, it continued the dispatch of a nurse to Sono Community Center in Mabicho. However, as of 1 September, that has also ended. From start to finish, this emergency relief period lasted 57 days. During this time, AMDA received support from a total of 265 Japanese and non-Japanese people alike, including doctors from Mongolia and student volunteers. AMDA also received a lot of support from affiliated medical institutions and businesses, etc. from Okayama, Kagawa, Kochi and Tokushima Prefectures via AMDA’s Platform for the Great Nankai Trough Disaster. According to a Kurashiki City Disaster Management Headquarters report, as of 4 September, there were still a total of 616 people evacuating as a result of the West Japan Torrential Rains. AMDA will continue to observe the situation.